Our Little Kingdom: She's Two! It's official: My baby turned two last week! I cannot believe that I've been a mother for two years. That two years ago, I gave birth to my first baby. That for the past (almost) three years, I have been pregnant, nursing, or both. That last one is kinda depressing. But one day, one fabulous day, I will take Excedrin and Lunesta and eat whatever I want. This is The Birthday Cake. My creation. I used a recipe from America's Test Kitchen--it's white cake, buttercream, and a blackberry-and-almond filling. The writing on the cake was an afterthought because I had leftover icing. Not bad! The cake wasn't as moist as I wanted it, though. I think that's because I baked it the night before and it had to sit, covered with waxed paper, until I could frost it the next afternoon. Next time I'll make sure I'm home all day to bake and frost it in the same day. The birthday girl blowing out her candles. It took a few tries to get the hang of it. The best present ever! A bunny Pillow Pet. She went cr-azy when she opened it! Good job, Aunt Carol. As soon as the shock of receiving a Pillow Pet wore off, Holly ran for her blanket. This is a picture of two-year-old bliss. Somebody else enjoyed the celebration too, perched in the safety of Grandma's lap. How did this child get so blond? Other than the hair, she is a miniature Andrew. On Monday, we had a little party for a few of Holly's friends. I found the idea for a Pancakes and Pajamas party online, and it was so much fun! We made cereal necklaces, bowled with a miniature bowling set, and ate pancakes and bacon and sausage. The best part was, the party started at 10:00 a.m. and ended in time for the kids' afternoon naps. The worst part was forgetting to hand out the party favors, which are still sitting in their basket in my kitchen, waiting to be delivered to the party guests. To top it all off, I took Holly in for her two-year well check-up this morning. She is 35 3/4 inches tall (90th percentile) and weighs 27 pounds (50th percentile). We love our sweet girl and are so glad she's part of our family! Even when she throws her two-year-old tantrums. I almost forgot the part favors at Paxton's last birthday party too. That's funny. Sounds like it was a success! What a funny look on Holly's face in the last picture! 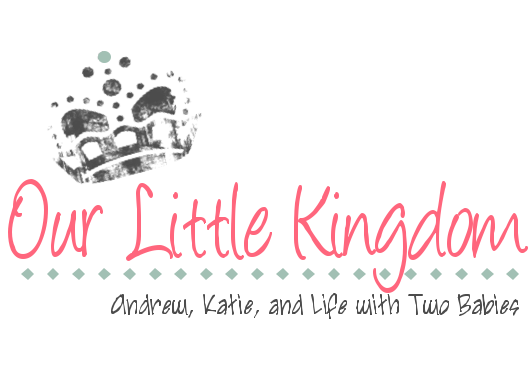 I'm Katie, wife to Andrew and mom to two fantastic little girls. I get to stay at home and play all day with my daughters, and we have so much fun! I also enjoy cooking and baking and have been known to try various craft and sewing projects. I love my little family!